I did this test at idle, with AC Off. 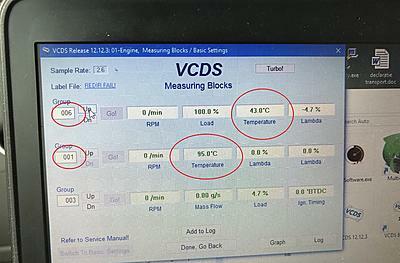 I made the same test with heating set at "HI"(more than 26 Deg), and the coolant temp raised at max 87 Deg(on VCDS Gr. 1 Field 2) and the coolant looks good. -when I turn on AC at Low Temp(Econ off, so AC Compressor is on), both fans are NOT running. The problem in my case seems to be that the cooling fans are not receiving any start command even if coolant reach 100 Deg, and I have no error on VCDS->Engine. Can anyone with 4.2FSI (even if is on other Audi or VW car) to test VCDS->Engine->Group 6 Field 3 to see which temp is showing there? Or anybody has any tips to solve the issue? Last edited by McCasian; 04-03-2017 at 01:18 PM. I've made a test today. I've put an 2Kohm resistor in paralel with the sensor, to fool the sensor measurements. I saw that this 2Kohm resistor is more affecting the measurements at low deg. Ex: 47 C Deg without resistor changed to 66 when I installed the resistor. 92 C Deg WO resistor changed to 98 C Deg with resistor. I kept the resistor in place(so all values writen here are affected by resistor), and I was looking carefully at everything. I observed that the coolant is raising the level with 2-3mm starting with 97-98 C deg until 101 C deg. At 101 C deg both fans are starting at low speed(I think "speed 1" is not correct because fans are PWM controlled so they works on continuous variable speed depending on temperature) and imediatelly the coolant is getting at low degrees until 98-97 C deg and the level on the expansion tank is also getting low with about 2-3mm. My conclusion, is that the temp sensor is faulty and because of incorrect reading, the "protection system" is not starting. Today or tomorrow I will order a new sensor and get back with the results. Last edited by McCasian; 04-04-2017 at 06:34 AM. Finally solved. The new temp sensor solved the problems. Tested with and without cap. Without cap the coolant it's just about starting to boil and the fans are immediately starting and everything get back to normal. With cap, everything is perfect. I've tested old vs new sensor and the difference was really big. At 90C deg water, the old one had 254 Ohms and the new one had around 180 Ohms. I started to investigate the problem when one of cooling system pipes was begining to leak a lot of coolant because of too high presure(with cap in place). Indeed, the presure was to high because when the fans are starting, at 101C deg in VCDS, but the real temp of coolant was actually much more deg. I can estimate that the coolant had actually about 115C deg when the sensor was reading just 101C deg. The temp sensor on mine was starting to whack out a while back. Hard starting and such. I happened to have my OBB code reader connected to it since I'd gotten an OBD error referencing a low coolant temp reading. I was driving down the road and happened to glance down and see the watertemp saying 40F for a few seconds before jumping back to around 185-190F. Put a new one in and haven't had an issues since. The gauge on the dash started working properly then too. Cooling fans are not working tried a few things now what?